This our sad attempt at a Grantham family portrait. It makes me laugh. Our poor dogs! I think the dogs are ready for stockings to be hung with dog goodies inside. Your tree looks pretty and I don't see your stockings hanging yet. You look so happy. Have fun through the holidays. 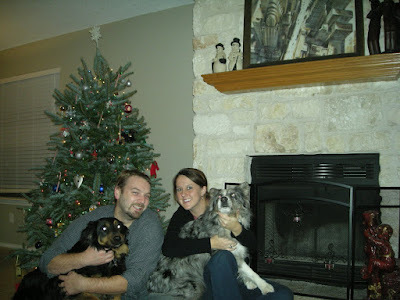 You and Mark look extremely happy but Miss Pepper and Clyde the Wonder Dog don't look too thrilled. Maybe they are tired of being exploited for their beauty! lol Really though the photo is definately y'all.